SBI PO Recruitment 2019 | State Bank of India PO Application Form 2019: SBI has recently invited SBI PO application for the recruitment of 2000 Probationary Officers (PO) in the various branches of the SBI across the country. The SBI PO application forms for the same are currently available on the official website. 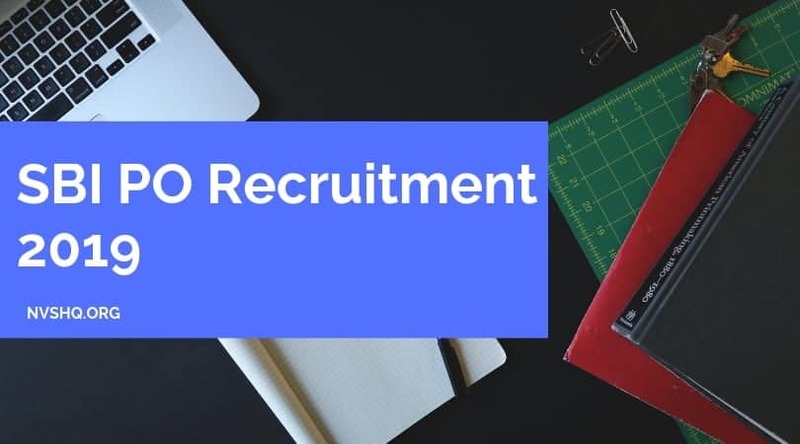 In this article, readers willing to apply will find complete information about SBI PO recruitment 2019. 2.1 How to apply for SBI PO Application form? Candidates who are interested can fill the application form before 22nd April 2019. As after the last date, no candidate will be able to submit application. Applicants should try to fill the application form on time. They should not wait for last date as various issues may arise at the last moment. Application for this recruitment can be done only through the online mode. No other mode of application is applicable. Candidates should not submit more than one application. In case of multiple applications, only the last valid application will be accepted. Before filling the application fee, candidates must go through the information bulletin and eligibility criteria carefully. They must have a valid mobile no. and an email ID. Candidates must keep all the necessary documents handy at the time of filling application form. They must fill all the details carefully. Before final submission of data in application form, candidates can edit and make correction into it only three times. After final submission of data, no change or edit will be allowed. The registration no. and password generated should be kept safe throughout the recruitment process. Candidates should note that they are not required to send the printed copy of the duly filled application form to the Bank. How to apply for SBI PO Application form? Visit the official website of SBI (mentioned above). Select the recruitment of PO in SBI option. Fill the basic details and generate a registration number and password. Now enter all the personal, qualification details asked. Preview the details carefully before final submission. Take a printout of the receipt generated and application fee for future references. Hard copy of filled in application form is not required to be sent to the bank. Applicants have to make payment of application fee through the online mode (debit card/ credit card/ Internet Banking). Applicants must have completed graduation from a recognized university/college. Applicants in their final year/semester are also eligible provided they should produce their graduation certificates at the time of interview. Candidates with qualification of Chartered Accountant are also eligible. The minimum and maximum age of the candidates should be 21 years and 30 years as on 1st April 2019 respectively. Selection of candidates for the post of Probationary Officer (PO) in SBI will be made through three Tier selection process viz. Preliminary exam, Mains exam and Interview and Group Exercises. The pre-examination will be an online exam of total 100 marks. No sectional cut-off will there. Candidates will be selected on the basis of marks scored in the online exam. It will be conducted on various exam centers established across the country. Candidates who will qualify the pre exam will be shortlisted for Main exam on the basis of merit. Main examination includes one objective test (online exam) and a descriptive test. Candidates qualifying the main examination will be called for Group Exercise and Interview round. GE will consist of 20 marks whereas interview will be of 30 marks. Final Selection- The selection of candidates in each phase will be provisional. The final selection and merit list will be prepared on the basis of marks obtained in the Mains examination and Interview & Group Exercise. Descriptive Test- It will include two questions of 50 marks. It will be test of English Language (Letter Writing and Essay). The call letter for all the phases will be made available on official website for downloading on the specified dates. For preliminary exams, candidates will be able to download their call letters from 3rd week of May 2019 onwards. Candidates should carry a printed copy of admit cards to the examination center along with a valid photo ID proof on the day of exam. Candidates not having a call letter and an ID proof will not be given permission to enter exam hall and shall be debarred. The result for preliminary exam is scheduled to be declared in the first week of July 2019. Candidates can check their result on the official website by using the registration number and password. Candidates should frequently visit SBI website for getting all the necessary updates related to this recruitment. For queries regarding the application, candidates can call at 022-22820427 or lodge their queries on http://cgrs.ibps.in. If have any question related to the SBI PO recruitment 2019, then leave comment below and we will reply ASAP. Try to fill the SBI PO 2019 application form online before the last date as that server may run slow due to last minute rush.